These are so amazing! Sweetness you won't believe. 1. Heat grill to a medium flame. 2. Wash carrots and peel, if desired. If your carrots have the fronds still attached, trim to about half an inch, and you’ll have a built-in handle to eat with later. 3. Whisk together butter, vinegar, and rosemary. 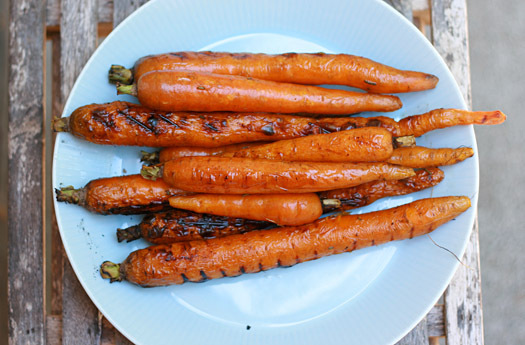 Arrange carrots on the grill (or in grill basket) and brush butter mixture over the carrots. 4. Grill for approximately 20 minutes, turning halfway through and applying more of the butter mixture. 5. When done, pile into a serving plate and brush on the remaining butter mixture.